Aerial view of the Cape Cod PAVE PAWS c.1986. Cape Cod Air Force Station is a U.S. Air Force station located in the northwest corner of Joint Base Cape Cod, United States, on Flatrock Hill in Massachusetts. 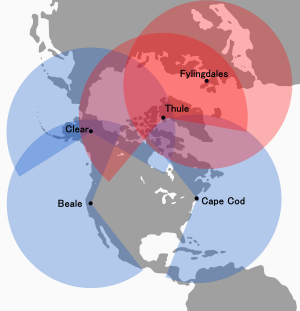 It consists of one PAVE PAWS radar station and is in continuous operation. The facility became operational April 4, 1980 as Cape Cod Missile Early Warning Station, but was renamed Cape Cod Air Force Station on January 5, 1982. The facility became home to the 6th Space Warning Squadron after the closure of the North Truro Air Force Station in North Truro, Massachusetts. Its main mission is to track space debris, intercontinental ballistic missiles, and submarine-launched ballistic missiles. It also tracked the spy satellite USA-193 before it was shot down. Its secondary mission is tracking Earth-orbiting objects such as the International Space Station, the Space Shuttle, any object that deviates from its known orbit, or any new orbiting objects. Radar screen for the PAVE PAWS at Cape Cod AFS, 1986. Computer room for PAVE PAWS at Cape Cod AFS, 1986. Note the four large hard disk units in the foreground. Wikimedia Commons has media related to Cape Cod Air Force Station. ^ United States Air Force. 6th Space Warning Squadron fact sheet Archived March 18, 2008, at the Wayback Machine. Accessed January 1, 2008.